The 16th at the TPC River Highlands in Cromwell, Conn. This par-3 is approached today over this pond. In the early 1980s, one approached it from the right, high on a hill. 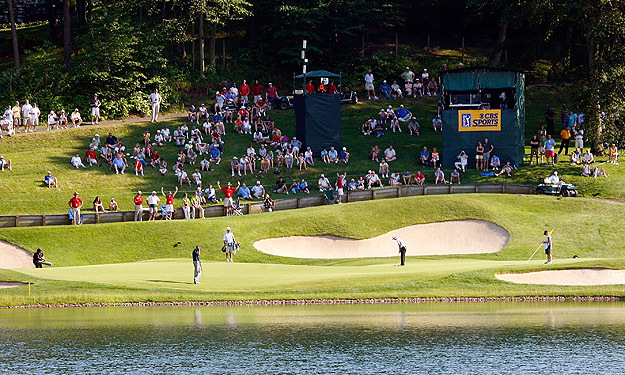 The recent Travelers Championship (Freddie Jacobson claimed the 2011 edition on June 26) got me thinking again about the TPC at River Highlands. A few years back I managed to hook up with a former collegiate teammate of mine, Stuart, for a friendly reunion/grudge match at River Highlands in Cromwell, Conn. We spent a lot of time that day musing that Division III college golf (we went to Wesleyan, in neighboring Middletown) had just about everything going for it. Golf wasn’t like other varsity sports; I mean, “practice” amounted to playing free, fully sanctioned golf every chance we got. You literally can’t put a price tag on that. In any case, Stuart and I were standing in the 1st fairway at River Highlands, musing over past conquests/humblings and waiting on the group in front of us, when I abruptly cut off our conversation and pointed with some urgency at a row of lovely homes sitting high on a hill, deep in the right rough. “You mean the 13th at the old TPC?” Stuart asked. Long story short, architect Bobby Weed — himself a Dyesciple and the PGA Tour’s in-house architect back then — was brought in a few years later to renovate the place. The joint was renamed the TPC at River Highlands, and everyone loved it. What New England golf fans might NOT remember is this: The short-lived TPC at Cromwell was not a “new” golf course. It didn’t just materialize from scratch, springing fully formed from the brow of Deane Beman there by the Connecticut River. No, the TPC at Cromwell resulted from a complete and utter renovation of an existing layout called Edgewood Golf Club, home course to the Wesleyan Cardinals for years. There were strong holes and weak holes at Edgewood, but during my first two years at Wesleyan, it was my “home” course; I enjoyed many a practice round there with teammates, took many a licking there at the hands of New England’s finest collegiate players. Stuart did, too. Now it’s gone. Replaced not once but TWICE by completely new incarnations in the space of just a few years. Golf courses do change, for good and for ill: Sometimes by design, at the hands of man. Other times via naturally occurring phenomena like tree growth and erosion. Some alterations, like those planned at Augusta National, garner breathless headlines while others are conceived and authored without a hint of public awareness or concern. Changes are welcomed by some, reviled by others. Only one thing is universal: All of it takes less time than one might think. At Edgewood, the situation was unique because so far as the Wesleyan golf team was concerned, the change happened utterly without warning. Toward the end of my freshman year, spring 1983, new golf holes started popping up like mushrooms — betwixt and between the existing holes! Unbeknownst to us, Dye had already been retained and had begun completely reconfiguring the layout right before our eyes. We didn’t have a clue what was happening. When we returned in the fall of 1983, more new holes had emerged. This was only a few years post-Sawgrass, and Dye’s now familiar mounding — quite mysterious and exotic back then — appeared to be bubbling to the surface. He didn’t just build new holes in former rough areas either. He completely reversed existing holes. He combined a few. Eliminated others. He played to existing greens from completely different directions. The entire routing was turned on its ear. We soon learned of the Tour’s grand plans for old Edgewood. And for one fleeting moment — I can’t honestly remember how long it lasted: 10 minutes, a day, a couple weeks — we, the Wesleyan Golf Team, entertained sanguine thoughts of practicing and playing matches at this completely retooled golf course, a resplendent-sounding place: The TPC at Cromwell… a future PGA Tour stop for chrissakes! That’s about when they booted us. Hal Phillips reckons his barn — from whence he writes on sporting, travel and lifestyle subjects (when he’s not overseeing his media company, which serves clients in North America and Southeast Asia ) — is the most cosmopolitan out-building in the Great State of Maine. He's the former editor-in-chief of Golf Course News and his freelance work has appeared in GOLF Magazine, Sports Illustrated, Links, Golfweek and dozens of other titles, some of which still exist. He Tweets from @MandarinHal. You may well be right, Alex. That’s what Wikipedia says, but I could have sworn it was TPC of Cromwell, for the name of the town where it resides. To be honest, TPC of Connecticut would have made more sense: more general, and recognizable. But I coulda sworn… But the course today is without a doubt better than Edgewood ever was. Very few original holes were kept: #3, a long par-4 is pretty much the same, I believe, and #4 is very similar. Today’s #8, a par-3 over water, is very much the same but it wasn’t #8… The 9th green today serves a dogleg right par-4; back in the day, that same green served a long par-3. The signature finish of today’s TPC is a mind-bender for those who knew Edgewood. Today’s par-3 16th green served a par-3 that played downhill from almost the completely opposite direction. Today’s 17th green served another par-3 that played from about the same angle as today’s approach shots, only further back and up the hill. The driving range today was the old 10th hole. Edgewood finished with a par-4 (17) that played along a ridge that today frames the right side of 18. The old 18th was a par-3 that played back across the valley (across what is today the 18th green) to the clubhouse.